Under the Dome is classic Stephen King science fiction. I was absolutely enthralled listening to this book. There were days when I had this book playing in my car and I sat in the driveway when I got home to listen just a little bit longer. Under the Dome takes you to a small town of Chester’s Mill in Maine. By all accounts Chester’s Mill is a typical small town. They have a small town budding criminal drug enterprise, the town bully, the ambitious politician. But one day an invisible dome drops over the town and everything changes. Stephen King describing the arrival of the invisible dome is absolutely amazing. I could envision the trucks crashing into the dome, the gardener’s hand being severed as the dome dropped down over the town, helicopters that crash into the dome, leaving smudges of soot. The writing is flawless to the point that I could literally see it happening in my mind. And that’s just the beginning of the story. Then the story moves on to the people inside the dome. How they have to cope with their new reality. What happens when you are cut off from the rest of the world by an invisible dome? First there’s fear, anger, violence, then slowly a new politics that arise under the dome. What would bad people do if they knew that they were cut off from the rest of the world and free from consequences? I thought Under the Dome was beautifully written. It’s such a simple premise, but one of the top books I’ve read in a long time. It’s got action and drama. I thought it was also a brilliant examination of human nature and human interaction. I highly recommend this book. And you can get it free today from Audible.com! How is this possible? Well, Audible has made this book available as a free download when you sign up for a free trial. So, here’s how it works. Anyone can sign up for a free trial of Audible. Included in the free trial, Audible allows you to download a free audiobook. You can pick from 100,000 titles. 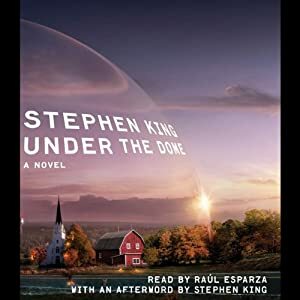 While you could select another free audiobook to download, one of your choices is Under the Dome by Stephen King. This book is 35 hours of pure goodness! CLICK HERE to Try Audible Now and Get Your FREE Audiobook!If you enjoy Stephen King novels, you’ll love this book. After you’ve downloaded the audiobook, you can cancel your free trial at any time. ..
what I meant was that most of the recordings of the books are copyrighted under audible or directly were produced by them. By the latter half of my statement, I meant audio books bay, torrent websites, and some were shared with me by a couple of my friends. I mean its quite unfair if I say something about Stephan King a guy whose books have sold more than 350 million copies when it comes on writing fiction on science and horror and super natural.